Pozi Countersunk wood screws that will drive into most european hardwoods including oak without pre-drilling. Perfect for joinery and furniture workshops, builders, plumbers and most proffessional trades. The C2 will replace most top brands and provide a large cost saving. 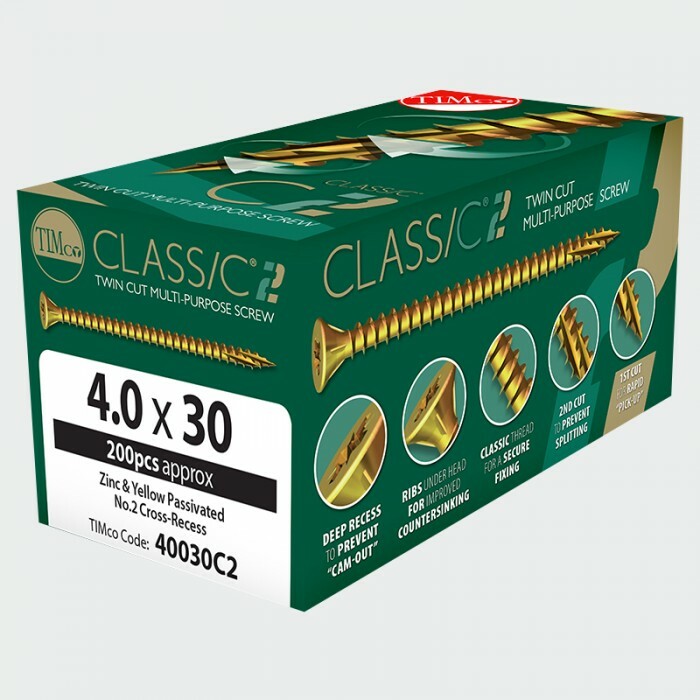 The Classic C2 screw has special features and benefits. The Classic C2 is a twin cut multi-purpose screw which has a deep recess to prevent Cam-out, ribs under the head for improved countersinking. The first cut has been designed for rapid pick-up and the second cut has been applied to prevent splitting. It can be used for multiple materials like hardwood, softwood, thin sheet metal, chipboard, plastic & MDF. C2 Head The C2 has a deep recess to reduce “cam-out” and ribs under the head for improved countersinking. Classic Thread The Classic thread ensures a secure fixing. Twin Cut Point Patented twin cut technology for rapid “pick-up” and reduced splitting.